A shooting incident in Arouca last night involving prison officers has resulted in the death of one man and the arrests of two others. The incident reportedly took place about 8 p.m. along the Golden Grove Road, Arouca. 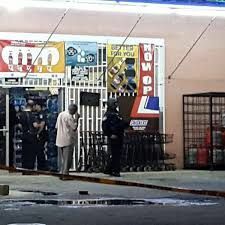 While up to early this morning information was still coming in, Express was told that a prison officer had just completed his shift and had entered Jun Lin’s Chinese Supermarket, located at the corner of the Golden Grove Road and Sawmill Street, to make a purchase. However, upon entering, the prison officer soon realised he had walked into a robbery in progress. He attempted to sneak back out of the establishment to notify authorities, but he was noticed by one of the robbers. The assailant pursued the prison officer and shot at him. At the same time, another prison officer was passing along the roadway and observed his colleague being fired upon. This second prison officer stopped to render assistance to his co-worker, and there was said to be an exchange of gunfire which resulted in the robber being hit about his body several times. The other robbers, which the Express was told included a 16-year-old boy, surrendered and were secured with tie-straps that the prison officers had on their person. The two prison officers were not harmed in this incident. The police were notified and a team of officers from the Arouca Police Station, led by Inspector Greene, visited the scene. The area was cordoned off and crime scene investigators reportedly recovered several spent shells. Two of the alleged robbers were taken for medical treatment at the Arima District Health Facility, where one of them died . The identity of the deceased is yet to be confirmed by relatives.